TGS is proud to offer the most extensive portfolio of high quality integrated regional products and data sets in the region. Coverage includes 2D and 3D seismic data, gravity and magnetics data, digital well logs, multi-beam (SeaSeep), piston coring logs and geochemistry analysis Additionally, we offer advanced processing and imaging services, interpretation products and data management solutions. The Carnarvon Basin is a prolific hydrocarbon province that continues to attract high levels of activity due to ongoing modern and high-quality seismic dataset acquisition and reprocessing, revealing attractive exploration targets. The offshore part covers approximately 535,000km2 with water depths up to 3500m, and is transitional southwards into the Perth Basin and northeastwards into the Offshore Canning and Roebuck Basins. The basin is a subsiding continental platform characterized by a thick Triassic succession and overlain by thinner Jurassic and younger sequences. A N-S to NE-SW structural trend created large fault-bounded structures that are proven to be highly successful to date. Gas has been the main phase of hydrocarbons discovered but exploration drilling results over the last ten years have hinted at the presence of an oil-prone Triassic petroleum system in addition to the proven gas play. The recent discovery of significant oil and liquid-rich gas accumulations in the neighboring inboard Bedout Sub-basin, within Triassic reservoirs sourced from mature Triassic organic-rich rocks, has again highlighted the potential of the oil play extending further west and outboard into the Carnarvon Basin. TGS has 110,920.1 km2 and 7,700 km of existing modern, high-quality 3D and 2D data respectively, that covers large swathes of areas of the Carnarvon Basin. Capreolus MC3D survey was acquired in 2015 by Polarcus and covers 22,315km2 across the Roebuck Basin. The survey was acquired using 12 streamers at length ranging between 8.1km and 9km, source volume of 3480in3 and utilising 12s continuous recording. PSTM and PSDM processing products, gravity and magnetic data and interpretation report are currently available for this survey. Capreolus MC3D images all the commercial oil and gas discoveries made in the Bedout Sub-basin - Phoenix South, Roc and the recent Dorado that confirmed the presence of an additional Triassic oil play. TGS, in partnership with WesternGeco, are currently reprocessing a total of 40,708km² of 3D data to produce a continuous fully imaged seismic volume across the Exmouth Plateau. The processing is done by WesternGeco through Broadband Pre-Stack Depth Migration (PSDM) workflow in several phases. Phase 1 is currently available for licensing with a full complement of products for AVO analysis. This includes 28,121km2 with data merge from TGS’s Honeycombs MC3D, Mary Rose MC3D and Mary Rose NE MC3D, WG’s Keystone MC3D and Aragon MC3D, and openfile Glencoe 3D, Sovereign 3D and Scarborough 3D. Phase 2 processing is currently underway and includes 12,587km2 of 3D data merge from TGS’s Gnaraloo MC3D, and openfile Cazadores 3D, Colombard 3D and Centaur 3D. Polly MC3D reprocessing is currently underway through Broadband Pre-Stack Depth Migration (PSDM) workflow by DUG. Polly MC3D covers 7,536km2 over the Beagle and Bedout Sub-basins, and the reprocessed data will be merged with Capreolus MC3D to provide a unique modern consistent dataset covering the Dorado discovery and the 2018 gazettal acreage, hence enabling the extension of the key features from the Dorado discovery into the Beagle Sub-basin, where the Triassic geology is similar. Polly 3D was acquired in 2013 by Polarcus using 12 6km streamers and utilising 6.2s record length. Early PreSTM version will be available by mid November and final PSDM by end of 2018. Beagle 2DCubed reprocessing is currently underway which will match all available vintages within the defined area of 38,600km2 to produce a 3D volume interpretable on a regional scale. 2DCubed will fill the gaps in existing 3D surveys and provide a continuous coverage of data for regional study of the area. The product is expected to be available in November 2018. Mary Rose MC3D survey was acquired in 2012 and covers an area over 8,800 km2 within the lightly drilled western outboard area of the Carnarvon Basin. The data was acquired using a 6km streamer length at a depth of 9m and utilizing a 6.2s recording. Pre–stack time and depth migration products with angle stacks are currently available for the survey. Recent success using this dataset were the Royal Oak and Lympstone gas discoveries. Mary Rose NE MC3D survey was acquired in 2012 and covers an area over 3500 km2. The survey was acquired using a 6km streamer length at a depth of 9m and utilizing 6.2s recording. Pre-stack time and depth migration products with angle stacks are available for the survey. Honeycombs MC3D survey was acquired in 2012 and extends over an area over 2500 km2 in the vicinity of the Scarborough gas discovery. The data was acquired using a 6km streamer length at a depth of 9m and utilizing 6.1s recording. Pre–stack time migration products with angle stacks are currently available for the survey. Recent success using this dataset was the Blake gas discovery. Three Bears Caspian MC3D survey was acquired in 2012 over an area in excess of 450 km2. The data was acquired using a 6km streamer length at a slanting depth of 6m to 25m and utilizing 6.3s recording. Kirchhoff pre–stack time migration products with angle stacks are currently available for the survey. Huzzas Phase I MC3D survey was acquired in 2014 over an area in excess of 2100 km2. The data was acquired using a 7km streamer length, CGG’s Broadseis/Broadsource technology and utilizing 9s recording that was cut down to 7.5s during processing. Kirchhoff pre–stack depth migration products with angle stacks are currently available for the survey. Huzzas Phase II MC3D survey was acquired in 2014 over an area in excess of 190 km2. The data was acquired using a 3km streamer length, CGG’s Broadseis/Broadsource technology and utilizing a 7s recording. Kirchhoff pre–stack depth migration products with angle stacks are currently available for the survey. North Carnarvon Basin MC3D survey was acquired in 2015 and covers an area over 13,000km2 in the northern, outboard areas of the basin. The survey was acquired using a 8.1km streamer length at slanting depth from 12m to 28m and utilizing 12s recording. Kirchhoff pre-stack time migration products with angle stacks are currently available for this survey. Monuments MC3D survey was acquired in 2015. The survey covers an area over 2300km2. The survey was acquired using streamer length of 8.1km, at a depth of 12m and utilizing 12s recording. Kirchhoff pre–stack depth migration products with angle stacks are available for the survey. Gnaraloo-Cazadores MC3D survey is a merged product that extends over an area in excess of 6,300 km2. This dataset includes the Gnaraloo 3D survey acquired in 2012 and a reprocessing of the 2009 acquired Cazadores 3D survey. Kirchhoff pre–stack time migration products with angle stacks are currently available for this survey. 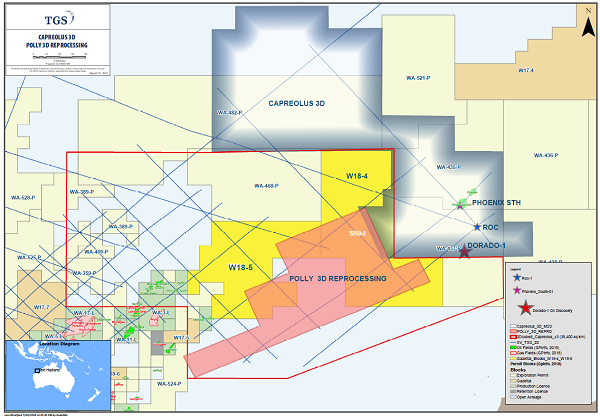 North West Shelf Renaissance MC2D survey acquired 7,700km of 2D seismic data in 2016 with long offset cables and deep record length, providing a large-scale regional picture with unrivalled stratigraphic control from numerous modern and deep key well ties, some over existing fields. This consistent dataset is ideal for large-scale regional basin studies to establish the geological framework and the better understanding of the deeper Carnarvon Basin. It is tied to some of TGS’s MC3D surveys. The data was acquired using a 10km streamer length at a depth of 18m and utilizing up to 12secs recording. 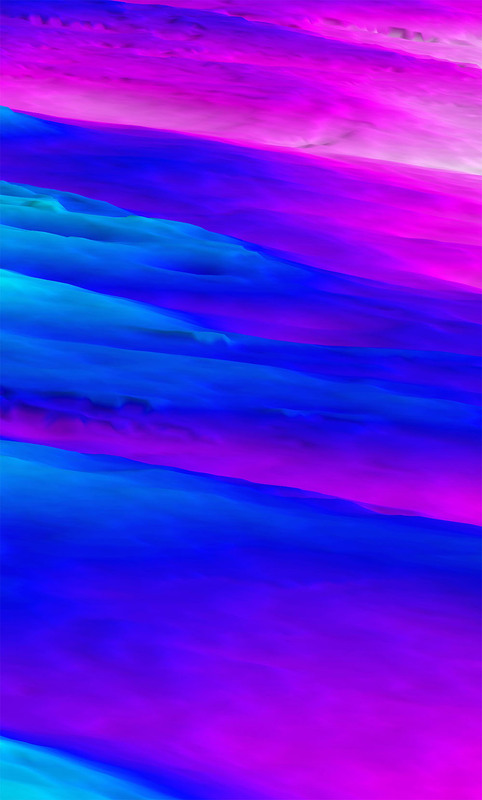 Gravity and magnetic data were also acquired alongside 2D seismic data. Kirchhoff pre–stack time and depth migration products are currently available for the survey. The Great Australian Bight is an emerging hydrocarbon province, on a geographic scale that is equivalent to the GOM or the North Sea, offering world class potential for giant discoveries and TGS’ Nerites MC3D covers 22,117 km2 of this vast frontier area. Nerites MC3D survey,located on the Ceduna Shelf, was acquired in 2014 over two seasons using streamer length of 8km, at a slanted depth of 12m to 30m and utilizing up to 10s recording. Kirchhoff pre-stack depth migration products with angle stacks are available for the survey. 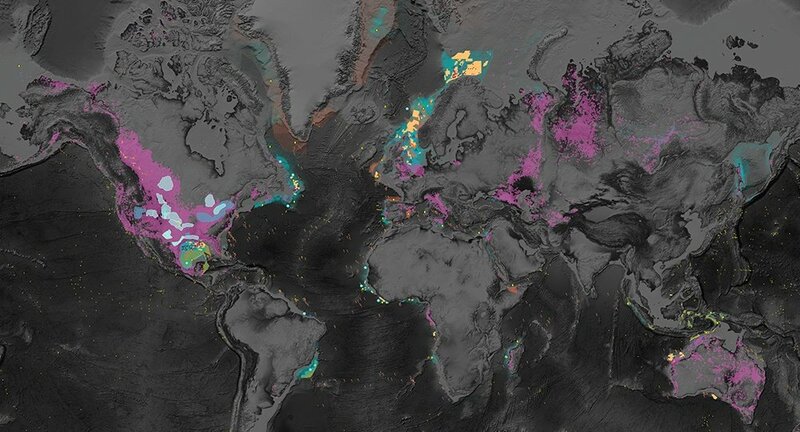 Hydrocarbon prospectivity within several play types have been recognized on this new dataset with good evidence for hydrocarbon accumulations being present. This dataset also shows a number of potential reservoir and seal pairs containing large hydrocarbon volumes. All prospective targets identified at Campanian, Santonian–Coniacian & Cenomanian–Turonian levels are in drillable depths. The Deepwater Taranaki and Reinga-Northland Basins are very large under-explored and undrilled basins, offering world class potential for giant oil discoveries. There is up to 6km of sediment fill and several prospective plays identified with numerous trapping styles. Recent offsetting wells have intersected reservoirs and source rock intervals which can be mapped into the basins and basin modelling indicates mature source rocks within both basins at two levels. The dataset comprises two vintages of data, the first is the Reinga survey acquired in 2009 and reprocessed by TGS in 2014/2015 and the second survey is the North West Frontier survey acquired in 2014/2015. The data covers an area in excess of 174,000km2 in water depths ranging from 90m to 2300m. TGS is pleased to announce that the purchase of the Capreolus 3D seismic survey from Polarcus has been completed. With data in over 35 countries worldwide, TGS has your E&P needs covered.